Our employee feature series allows us to highlight key employees at Pelesys and their departments to showcase how they have helped Pelesys become a global leader in aviation training. Carrol Frizell is the manager of Courseware Development which is made up of 35 team members. The Pelesys courseware library is one of the largest, independent courseware libraries in the industry. The Courseware Development team are responsible for bringing these courses to life by creating high-quality 2D / 3D graphics, digital images, animations and more to ensure top quality training material. 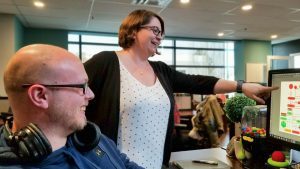 As the manager of courseware development, Carrol is a truly invaluable member of the Pelesys team and we sat down with her to get a look inside her job and to get to know her a little more. How long have you worked at Pelesys? I’ve worked with Pelesys for 12 years. I started here in August of 2006, 2 months after graduating from the Art Institute of Vancouver. I started out as a Junior Graphic Designer and have moved my way up through Team Lead to Manager. It is amazing to see the growth of the company over the last 12 years, being a company of less than 15 people when I first started to what we are today with over 50 people. What do you love the most about Pelesys, the company? The people and the environment – Pelesys has cultivated a very welcoming and open place to work. I also like everything I’ve learned about aviation while working here. I can’t say aviation was a very interesting subject to me when I started at Pelesys, but over the years I’ve played this game with our Lead SME pointing out the different planes as they fly by and I’m getting better at correctly identifying them. What do you love the most about your specific role within Pelesys? I’ve been in the Manager position for the last four years and I find the job challenging in new ways all the time. I’m happy to solve my way through the challenges and continuously learn new skills. I feel like I have grown alongside the company. Tell us a bit about yourself – what do you like to do when you’re not at work? Ever since I was three or four years old I wanted to work for Disney. While I didn’t end up there I did follow that dream to school for animation, and I believe I wouldn’t be where I am today without that schooling. (I still love Disney, I have pretty much every animated Disney movie on a special shelf at home). I am an artist and crafter in my spare time, and I don’t know what I’d do with myself if I couldn’t listen to music. What’s your favourite place you have ever traveled to? I think my favourite place would have to be Scotland. The scenery was gorgeous, the people were amazing and it’s where I was proposed to – I’ll never forget that. What trip is on your bucket list? There are quite a few places of course, but my top three would have to be Iceland, New Zealand, and I’d like to travel within Canada – I really want to go to Newfoundland. Our Pelesys team is growing rapidly and we’re always looking to add new talent across a variety of different departments including graphic designers and software developers to help build our industry-leading aviation training courses. If you are interested in a career with Pelesys in the fast-paced world of aviation training please check our current career opportunities here. You may also be interested in learning about the history of Pelesys with our president and founder, George Wang. If you have any other questions related to Pelesys’ courses or services please send us an email or give us a call at 604-233-6268.